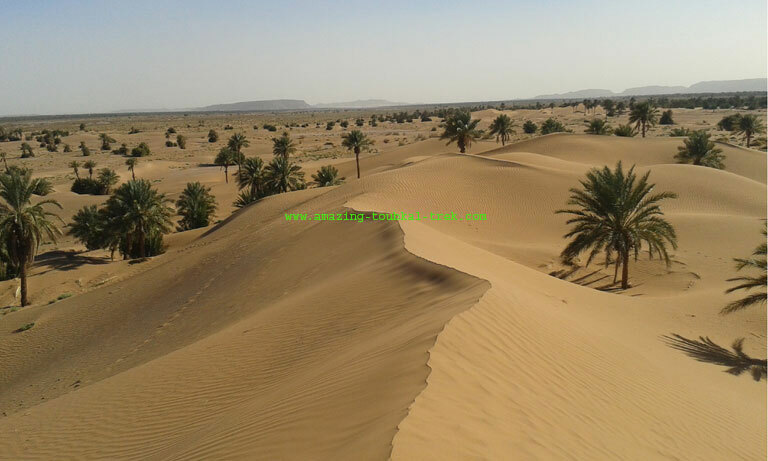 Draa valley desert trek: 6-day hiking Sahara desert dunes in the stunning Draa valley and Mhamid region. 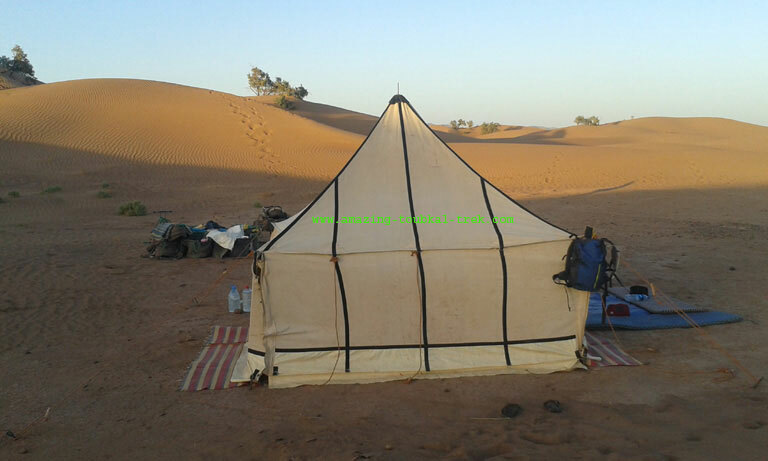 We invite you to explore the beautiful Sahara desert and remote campsites in the dunes. Draa valley is the longest river in Morocco and is shaped by the merging of the Dades River and Imnane River. It starts from the Atlas Mountains to Zagora and from Zagora to the Atlantic Ocean. Local people of Draa valley use its water to irrigate palm grove and small agriculture along the river. The dwellers of the Draa are called Drawi, used to bring up to the dark-skinned people of the Draa that make up the most significant part of its dwellers. Draa valley leads us to the desert in all its forms massive dunes, tapered rocks blackened by the glowing sun. All nights will spend in tents under a starry sky. – Meet the desert nomads. After an early breakfast, we’ll drive towards the Tizi N’Tichka then to Ouarzazate city where we’ll have lunch. We’ll then continue to the valley of the Draa passing through so many fortified villages to Zagora town (the gateway to the desert). Finally, head to the Dunes Lalla Kebira which is the starting point of the hike. Overnight in tents. 7 hours drive. After breakfast in the morning, we’ll begin our hike. We’ll hike down towards the Beni Ali oasis. Lunch will be in the shade of the palm grove. After lunch we’ll continue on the Wild Oasis of Foum Taqqat beside the Jebel Bani, that’s where we’ll camp overnight in tents. 5 hours trek. We’ll trek through the palm grove after breakfast to the oasis of Nesrate (lunch place0. In the afternoon We’ll take a nice walk via so many Berber villages along the valley. Overnight at KsarAitIsfoul in tents. 6 hours walk. We’ll begin our hike after breakfast; we pass through the farming land and dunes to have lunch near Sidi Saleh shrine. After lunch, we’ll trek to the camp close to Tidiri Dunes. We spend the night camping in tents. 5 hours trek. After an early breakfast, we’ll begin our trek by walking on the dunes of Tidiri. We’ll have lunch before we arrive at the Dunes of Regabi. After lunch, we’ll take a 2 hours trek to reach the final camp on the Erg Lihoudi. Overnight in tents. The estimated duration of the trek is 6 hours. We’ll head back to Marrakech early in the morning after breakfast (7-hour drive). You’ll spend the night in the hotel at Marrakech. 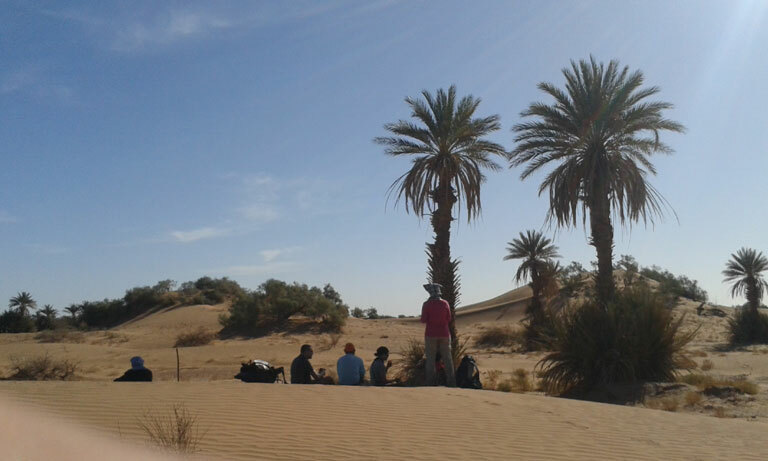 – Draa valley desert trek is available and can be arranged for groups of all sizes. 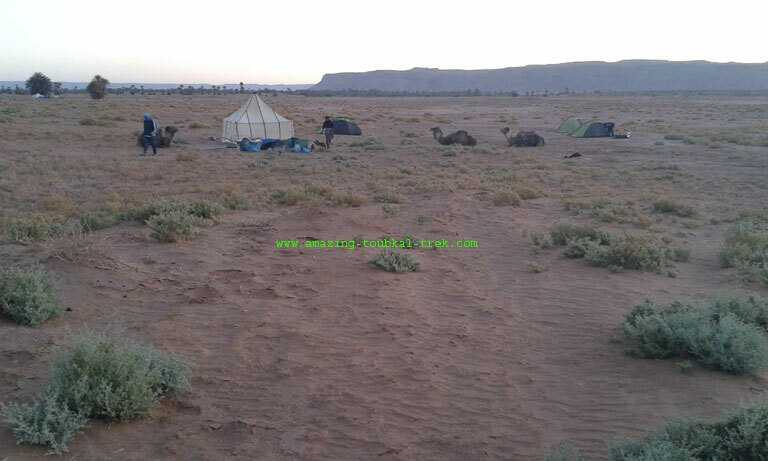 Draa valley desert trek: Amazing camel trekking in Draa valley oasis and desert dunes. Draa Valley Desert Trek, Hikking Sahara Desert Dunes.